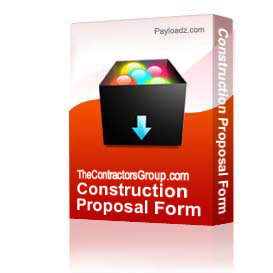 Use this instantly downloadable construction proposal form to bid as many projects as you''d like. It comes with unlimited usage and unlimited free replacement. Please note that although it states below that there are no refunds or returns on digital downloads, this downloadable proposal form comes with 100% satisfaction guaranteed or your purchase will be fully refunded.